Jimoh Moshood, Abuja: The Nigeria Police Force has observed the recent trends of the event in the Social Media on the #ENDSARS and the controversy being generated by the innuendos from the allegations and other misconceptions as it concerns the Operational roles and activities of the Special Anti-Robbery Squad (SARS), a detachment of the Nigeria Police Force. Undoubtedly, the Special Anti-Robbery Squad (SARS) have been doing very well in fighting violent crimes such as Armed Robbery, Kidnappings and Cattle Rustling in the country in the recent time and this has resulted in drastic reduction of incidents of the mentioned violent crimes nationwide. However, the Inspector General of Police, IGP Ibrahim K. Idris NPM, mni concerned with public interest and the need to reposition the Special Anti-Robbery Squad (SARS) for more efficiency and effective service delivery to all Nigerians and ensure that the Special Anti-Robbery Squad (SARS) operates based on International Core Value of Policing with integrity and make sure the rule of law prevails in the operations and activities of the outfit, the IGP has directed the immediate re-organization of the Special Anti-Robbery Squad (SARS) nationwide and instant investigation into all the allegations, complaints and infractions levelled against the personnel of the Special Anti Robbery Squad across the country by the IGP X-Squad of the Force. In the new arrangement, a Commissioner of Police is now the overall head of the Federal Anti-Robbery Squad nationwide under the Department of Operations, Force Headquarters Abuja. The Police Zonal Commands, State Commands and Divisions will continue to operate anti-crime units/sections, crime prevention and control squads and teams imperative to prevent and detect crimes and criminalities in their Area of Responsibilities, and other crack squads necessary to sustain law and order and protection of life and properties in their Area of responsibilities (AOR). IGP Ibrahim K. Idris NPM, mni concerned with public interest and the need to reposition the Special Anti-Robbery Squad (SARS) for more efficiency and effective service delivery to all Nigerians and ensure that the Special Anti-Robbery Squad (SARS) operates based on International Core Value of Policing with integrity and make sure the rule of law prevails in the operations and activities of the outfit, the IGP has directed the immediate re-organization of the Special Anti-Robbery Squad (SARS) nationwide and instant investigation into all the allegations, complaints and infractions levelled against the personnel of the Special Anti Robbery Squad across the country by the IGP X-Squad of the Force. Federal Anti-Robbery Squad (FSARS) will now exist and operate in the State and Zonal Commands under the Commissioner of Police (F-SARS) at the Force Headquarters. A Federal SARS Commander of a Rank of Chief Superintendent of Police (CSP) and not below Superintendent of Police (SP) will be in charge of FSARS in State and Zonal Commands across the Country. All Commissioners of Police have been directed by the Inspector General of Police to comply with this directive with immediate effect and warn their personnel not to pose as SARS operatives. 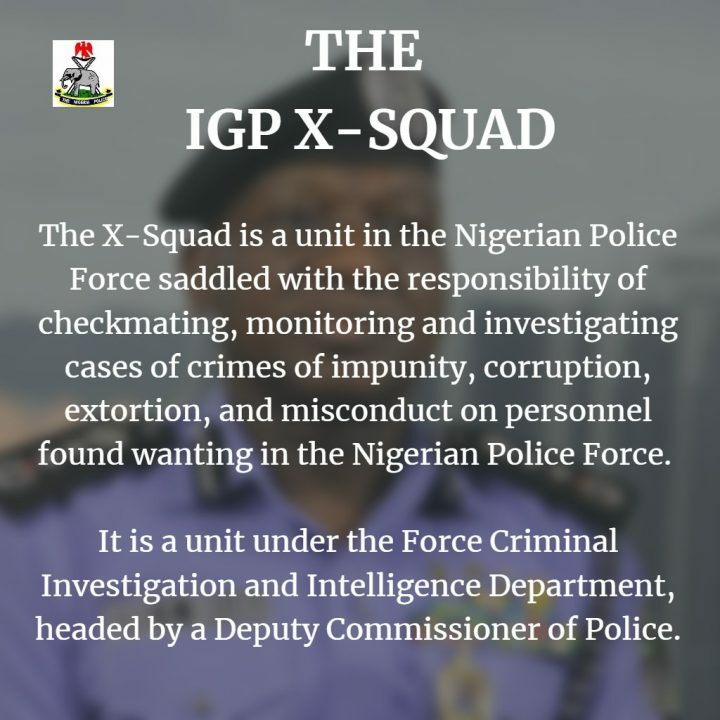 The IGP X-Squad has been mandated to go round the Commands and Police Formations nationwide to ensure strict compliance and apprehend any erring police officer. Furthermore, a new training program to be organized by the Force in collaboration with some Civil Society Organizations (CSOs), Local and International NGOs, and other Human Rights Organizations on core Police Duties, Observant of Human Rights and Handling, Care and Custody of Suspects have been directed by the Inspector General of Police for all Federal SARS personnel nationwide with immediate effect. However, aggrieved members of the public who have any complaint in the past or present of violation of their rights by any Special Anti-Robbery Squad (SARS) personnel anywhere in the country are to report through any of the following channels for investigation and further actions.